In this article, Vogel, Petersen, and Schlagger (2014) write about the role of the brain in developing reading proficiency. The article begins by pointing out that reading is a fascinating skill to study not only because it is so important to the everyday lives of both children and adults, but also because it is a recent human invention. Unlike human abilities such as language, attention, vision, and hearing, reading is too new to be a product of evolution and thus occurs in a system (the human brain) that is not specialized for reading. How, then, does the brain learn to read? We have made much research progress on that question in the last quarter-century with the advent of human neuroimaging tools, including functional magnetic resonance imaging (fMRI). With these tools, we can noninvasively look at what the brain is doing when we perform particular tasks like word or sentence reading and how this activity changes over time. From these studies, we have learned that reading consistently activates many different regions of the brain, more on the left than the right. One important region that is consistently active during reading is the underside of the left occipital/temporal lobe, termed the visual word form area (VWFA; red sphere in Figure 1 below). We have learned that children who struggle to read often underutilize reading-related regions, including the VWFA. The Texas Center for Learning Disabilities is heavily invested in learning more about how the brain might work differently in struggling readers and how strong reading interventions affect this pattern. Figure 1: The left hemisphere of the brain. The VWFA (red sphere) is shown with parts of the brain that correlate with VWFA activity (orange regions). 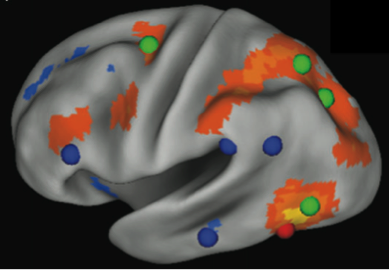 The VWFA functional connectivity pattern overlaps more with dorsal attention regions (green spheres) than reading-related regions (blue spheres). From Vogel et al. (2012). Over the last decade, the VWFA has been the subject of much debate among neuroimaging researchers. The VWFA got its name because it was shown to be activated mostly for familiar words as opposed to certain other kinds of stimuli, like random strings of letters or other symbols (e.g., the VWFA was thought to “prefer” familiar words). However, this idea has been questioned because in other research findings, the VWFA is not word specific. A counterargument has been made that the VWFA is not a “word form” area, but rather that it mediates more general visual attention mechanisms. Instead of being active for only a specific type of input (words), the VWFA is active for any input that has certain characteristics. It just so happens that many of these characteristics are shared with words: stimuli that are presented visually, grouped together as a common pattern, and easily separated from their background (high spatial frequency, high-contrast visual input). One sign of strong readers is that they are quick to identify words—in other words, they read fluently. The VWFA is readily engaged during this efficient, fluent reading, but it is also engaged whenever the brain is confronted with any high spatial frequency, high-contrast visual input. Thus, it may not be a word-specific region. In this article, Vogel and colleagues review and extend this counterargument. They present three lines of evidence in support of the VWFA as a more general region that evolved to care about aspects of visual processing that happen to be highly suited to reading print. This paper reviewed the debate regarding the specificity for words in the VWFA and summarized three recent experiments by their group to test this word and reading specificity. Test 1: Does the VWFA prefer words? Twenty-seven right-handed adults ages 21–26 were scanned with fMRI while they made a “same” or “different” judgment on pairs of stimuli. Pairs of either line drawn pictures, or four-character strings of real words (e.g., road), consonant strings (e.g., fgrt), fake words (e.g., pret), nonwords (e.g., ppid), or foreign-language words (e.g., characters in Amharic, the Ethiopian writing system) were presented, and activity in the VWFA was compared. Results: The VWFA had greatest activity for foreign-language strings, followed by pictures and consonant strings, and then familiar words. Such a finding is clearly inconsistent with the VWFA preferring familiar words. How does this finding fit with “high spatial frequency, high-contrast visual stimuli”? All of the individual stimuli were fairly high spatial frequency, but the VWFA preferred the most visually complex stimuli (Amharic characters) to the least. Importantly, the VWFA also showed a tendency to “group” familiar stimuli (Arabic letters) and process the group of stimuli as a whole, but to process unfamiliar stimuli (Amharic characters) one at a time (letter by letter). Test 2: Is VWFA activity more similar to reading-related regions or attention-related regions? Twenty-two children ages 6–9 and 23 adults ages 21–26 participated in an fMRI study where they simply looked at a plus sign on a screen for several minutes without falling asleep. This type of data collection in fMRI is called “resting-state functional connectivity MRI” because researchers look for parts of the brain that activate together (functionally connected) when a participant is not performing any specific task. Researchers examine this low-frequency signal of brain activity and look for correlations in the activity across pairs of brain regions. These correlations are thought to reflect functional networks of brain regions that work together frequently over time (functional relationships). Researchers know the areas of the brain that are activated during reading-related activity and those typically activated for attention-related tasks. This goal of this study was to look at the resting time course of the VWFA and see how it correlated with other reading-related brain regions compared to attention-related brain regions. Results: The VWFA was not strongly correlated with other reading regions. Rather, it was strongly related to attention-related regions, supporting its processing role in attending to visually complex groups of stimuli (see Figure 1 above). This relationship with attention-related regions strengthened over age. Test 3: Is VWFA activity more similar to other reading-related regions than any other parts of the brain? Three groups of participants, 38 children ages 6–10, 38 adolescents ages 11–14, and 38 adults ages 21–29 participated in this fMRI study. As in Test 2, participants simply looked at a plus sign for several minutes, and the resting-state functional connectivity MRI low-frequency signal of brain activity was studied. In this experiment, however, the whole brain was included, involving 83 brain regions, including reading-related regions from a meta-analysis of reading studies. Instead of comparing single correlations between two brain regions at a time (83 x 83 comparisons), mathematical modeling techniques were used to look for clusters of regions, or brain networks, performing with a high degree of similarity. Results: As in Test 2, the VWFA was not strongly linked to other reading-related brain regions. In fact, no reading-specific brain cluster emerged from the analysis. The lack of a reading network was highly similar over all ages. But the analyses did reveal “communities” of brain regions consistent with attention (a frontal and parietal network) and with vision (an occipital and temporal network), among others. The VWFA region correlated with visual and attention-related regions, and other reading-related regions separately correlated with different functional brain networks. This recent research indicates that the VWFA is not specialized for reading. The authors present three main points of evidence in support of this claim. First, the VWFA did not show specific sensitivity to words in a set of task-based studies that directly compared pictures, words, foreign-language words, and consonant strings. Rather, the VWFA appeared to be active when processing complex visual information in groupings (words, pictures, or other “grouped” stimuli). Second, the VWFA was examined for functional relationships to other reading-related regions by using another fMRI technique, but VWFA activity at rest best correlated with attention-related regions, not reading-related regions. This finding supports the VWFA’s possible role in processing a variety of visual stimuli in appropriately sized groupings and also in guiding attention to those stimuli. Third, when the VWFA was examined in the context of the whole brain activity at rest, the VWFA again clustered with visual- and attention-related brain regions, not other reading-related regions. In fact, no reading-related network emerged, indicating that the reading process co-opts many parts of the brain that evolved to serve other functional purposes. These results have implications for our understanding of reading in at least two ways. Recommendation 1: These results remind us that fluent reading is, evolutionarily speaking, a “new” skill. Why does that matter? It means that to be a good reader, we need to co-opt brain mechanisms that evolved for other purposes; these mechanisms control skills that do have an evolutionary basis—vision, hearing, attention, speech, and importantly, language. It also means that to be a good reader, it is necessary to learn how to read. We need to teach the brain to engage all of those mechanisms simultaneously. To do so, we should recognize the importance of time-on-task reading and directed close attention in the reading process. Skilled reading requires not just frequent exposure, but also engaging, explicit instruction. This instruction includes not only teaching in schools, but also activities designed to prevent the “summer slide” in reading skills, whether through family reading or community-supported literacy programs. Keeping children exposed to and engaged with print material over the whole year in a structured manner may be critical to achieving fluent, high-level reading skills. In the case of the VWFA in particular, this finding means that as we learn to read, we facilitate the way that the VWFA processes words. Recommendation 2: What does it mean that the VWFA is activated but not specialized for words or reading, but instead serves a more general visual and attention processing function? It does not mean the best route to fluent reading is to train students’ vision in general, rather than focusing on text. It does mean that early and frequent exposure to written words is critical for training the developing brain to care about the processing of letters and words. Frequent exposure and instruction helps the VWFA to become a rapid recognizer of print. Delayed access to print can make it increasingly difficult to automatize word recognition as a child ages because the flexibility in how the brain responds to stimuli reduces over age. Therefore, a lot of early, explicit exposure to print in childhood is critical. This idea is something that teachers and researchers have long known—the present results help to connect how this initial literacy experience is related to the brain and why it is harder to remediate reading problems as children get older. This research demonstrates the immense importance of frequent guided exposure to print and literacy early in life. Baer, J., Kunter, M., & Sabatini, J. (2009). Basic reading skills and the literacy of America’s least literate adults: Results from the 2003 National Assessment of Adult Literacy (NAAL) supplemental studies. Washington, DC: National Center for Education Statistics. Dehaene, S., & Cohen, L. (2011). The unique role of the visual word form area in reading. Trends in Cognitive Science, 15, 254–262. Price, C. J., & Devlin, J. T. (2011). The interactive account of ventral occipitotemporal contributions to reading. Trends in Cognitive Science, 15, 246–253. Vogel, A. C., Miezin, F. M., Petersen, S. E., & Schlaggar, B. L. (2012). The putative visual word form area is functionally connected to the dorsal attention network. Cerebral Cortex, 22, 537–549.